WASHINGTON - Former U.S. ambassador John Bolton said in a speech at the Conservative Political Action Conference Saturday that Americans should be wary of the fall of Egyptian President Hosni Mubarak, arguing that it could lead to the country falling in the hands of anti-American Muslim extremists. It is the "responsibility of our government to protect our interests and our values and our friends and our allies," Bolton said. Referencing former President Theodore Roosevelt, he added that "first and foremost we must make the world safe for ourselves." Mubarak's fall may end up making America less safe, Bolton said, because in a democracy a radical group like the Muslim Brotherhood may end up in power. He warned of the threat of "rising radicalism in the Middle East" and said Sharia law could soon be imposed on Egypt's citizenry. "We have to have a careful and prudent approach to these developments, because we've seen revolutionary situations go wrong too many times before," said Bolton, pointing to the Nazis, Hamas and Hezbollah. Mitch Daniels: Debt is the New "Red Menace"
Bolton, who is considering a GOP presidential run, said that democracy is "a way of life," not simply a political system. "We have to acknowledge that a Democratic election can produce illiberal results," he said. The former ambassador argued that allowing the Muslim Brotherhood to participate in Egyptian elections is putting the country on the "road to disaster," and suggested the Obama administration has been "hesitant, inconsistent, confused and just plain wrong" in its handling of the situation in Egypt. To a standing ovation from the conservative activists gathered for the conference, Bolton described President Obama as "weak, indecisive and apologetic." Bolton said he does not believe Mr. Obama cares about foreign policy because it gets in the way of his priority of "nationalizing our health care system." He attacked the Director of National Intelligence, James Clapper, for suggesting the Muslim Brotherhood is a largely secular organization, saying the reason he opposes Clapper's resignation is because "in this administration, we could get somebody worse to replace him." 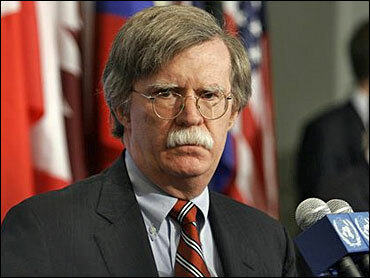 Bolton also attacked the administration for its handling of Russia and its passage of the New Start missile treaty. Taking a stand against the call by Libertarian-leaning Republicans like Ron Paul to reduce defense spending, Bolton said it is "not the time for indiscriminate budget cuts in our national defense budget." He said that domestic spending and entitlement programs should be cut instead, stating, "A dollar well spent on defense is much more important than a dollar well spent in the agriculture department or the interior department." Bolton was one of a number of potential Republican presidential candidates to address the conference, a gathering of about 11,000 conservative activists which wraps up Saturday afternoon.